BOOF! Keegan here. Do you like the picture of me on the couch? That is MY idea of how to help the two-footed creatures at the Hounds of Heaven do psychotherapy. 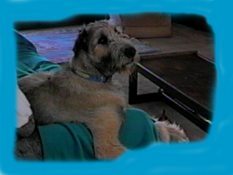 But Deborah and Bill tell me it is the two-footed patients who are supposed to be on the couch -- phooey on that! Well, sometimes I let the patients share the couch with me. Mom and Dad just shake their heads and mutter something about "what would Sigmund Freud think." Who's he anyway; he probably didn't have any Irish Wolfhounds (or even Golden Retrievers like Becka) to help him do psychotherapy. I'll bet that's why he came up with all those strange theories instead of figuring out that us dogs are the ones who know about how humans can live good lives: just get an Irish Wolfhound (or two or three or more) and spend all your time loving and being loved! These days Becka and I spend the work days in Bill's office, Tulia and Carina are in Deborah's office, and Fionna spends time in each. We all get to see and slobber on a bunch of people each day which is probably why people get better. Slobber heals, don't you know. Sometimes Becka and Fionna and I even get to go to group therapy where we get to slobber on a whole roomful of people at once, and get lots of attention. The only problem with being therapy dogs is that Mom and Dad do all the billing for psychotherapy services in their names. They say that insurance companies don't let Irish Wolfhounds bill for services. Sheeeeesh! Well, I'll now turn this section over to Deborah and Bill so they can speak in human terms about doing psychotherapy with dogs. There are a number of organizations and people all over the world who are working with therapy dogs. Unlike most of those people, we do not visit schools, nursing homes, or hospitals with our dogs. Our dogs help us in doing psychotherapy at our office. When we first got Becka, Bill brought her to work because he wanted to spend as much time with her as possible, and we only hoped that she wouldn't be "too disruptive." What we found was that she actually made a positive difference by her presence. As a result, every Irish Wolfhound who has come into our lives has been brought to work with us and is with us as we see patients. How do they help us? Over the years many people have told us that they were extremely nervous about seeing a psychotherapist and the prospect of telling very personal parts of their lives to "some stranger." The fact that we have one or more dogs with us made us seem more human, or as one person put it, "user friendly"! The dogs are a great way to begin to communicate about a "safe" subject, and then after some rapport is established, we can move on to what has brought the person in for help. The dogs are also very good at perceiving what is going on with a person below the surface. All of our dogs will get visibly upset (although they all show it differently) if someone is experiencing intense feelings that she or he is trying to deny or avoid. Once a person begins to own and express the feelings, the dogs will calm down! They also let us know if they sense that a person is carrying enough hostility to indicate that the person may be dangerous. We've learned to trust their reactions, because over time they have proven to be remarkably accurate. Our dogs also set, and help us to set, healthy examples for living. Lots of people are in great distress because the standard they hold for themselves is perfection. As anyone who has lived with a dog knows, the dog is not perfect, and certainly no person who is in relationship with a dog can claim they are perfect either. It's impossible for anyone to keep either of us on some pedestal of perfection when we have dog slobber on our clothes (or ears or glasses!) or when one discovers that, once again, one of us has put on a pair of socks that Carina has bitten a hole through (while the socks were on the person)! The people we help have unavoidable evidence that we, our dogs, and our lives are imperfect, and yet our lives are filled with many good things, the most important of which is the quality of our relationships with ourselves, other living creatures (two footed, four footed and otherwise), and God. We do not "pretty up" our lives for our patients. They see that Fionna regurgitates her food and that we have to clean it up. When she was very ill and appeared to be dying, the people we help knew what was going on, saw how distraught we were, and when Fionna was able to return to the office, they saw how thin, ill and weak she was. They see the inexpressible, immeasurable joys and sorrows of lives lived fully, and can learn by example that what makes the sorrows in life bearable are those good relationships. Our dogs also provide living, breathing, slobbering, boofing, examples of what being in good relationships can lead to. Every time one of the dogs turns upside down, sighs happily, and goes peacefully to sleep (thereby making themselves very vulnerable), they teach by example how good it feels to be in a positive, trusting environment (which none of our patients had as children). Those patients who have been in therapy when we have brought a new Wolfhound puppy into our lives have been able to see that kind of "good enough" (as in, NOT perfect) relationship unfold. Finally, and in many ways most importantly, our dogs give us the strength and faith to keep doing the work that we do. Psychotherapy is very difficult work, as it deals with all of the dark sides of human nature and the destruction those sides can wreak. At times we get temporarily overwhelmed, discouraged, exhausted. But they are always there, with their constant, loving, humorous, and trusting presence creating a balm for our weary selves. Just as they and other dogs are and can be in anyone's life who is willing to open their heart to them. The Michigan Psychotherapy main site.